This spectacular railway was one of the great train journeys that could be experienced. I had intended to say enjoyed but decided there were much more appropriate adjectives as at times the trip could be quite threatening! It is a relatively short journey of some 26 miles that was to lead to greater things with a railway stretching all the way back to Europe. However that never happened and this branch line operated by Pakistan Railways starts in the regional capital of Peshawar and takes you into the mountains and the Afghan border at Landi Kotal. Leaving Peshawar the journey will take you through 34 tunnels and across 92 bridges of various sizes to cross the summit of the pass at over 3500 feet above sea level. It is an engineering masterpiece. At the time of this journey the service was one train per week each Friday with the round trip just about completed in daylight. The train usually had at least a couple of passenger coaches and a few freight wagons and, because of the zigzags, had a locomotive at each end of the train. The main station in Peshawar was always well maintained and there was always a send off from the station master as the train headed into the mountains. Usually there were a few foreigners on the train which gave you a sense of reassurance. Climbing steeply out through the suburbs of the city the railway soon reached an arid plain with the mountains forming a rugged backdrop. You passed the police checkpoint on the adjacent Khyber Pass road which was always full of overloaded trucks. Photo - The train between the first and second reversals. Note the tunnels to the left and the line higher up the mountain. This is the serious section of the line. It looked a hostile environment. Scattered houses on either side of the line were fortified. An outside perimeter wall with just one entrance protected the living quarters inside. Danger or at least the perception of it seemed to rule this land. At either end of the train SGS class 0-6-0s nos. 2511 and 2386 were working well, although 2386 did not seem as well tuned with a lopsided beat. 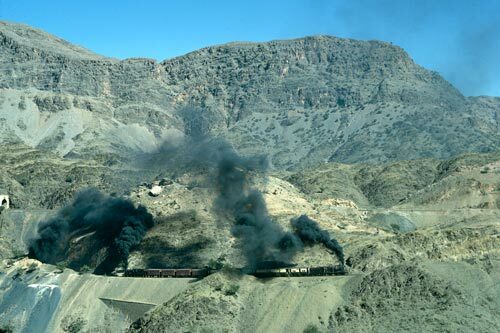 The first station was Jamrud after which the mountain section began. The entrance to the pass was impressive with little sign of vegetation. The road snakes uphill with trucks belching black smoke. Beside the road are regimental emblems carved in rock reminders of the many troops that have passed this way. The gradient steepens and the train slows as the two engines struggle uphill. The first reversal is reached. Here the train stops a few minutes and then reverses with the trailing engine in the lead. This enables height to be gained more quickly as the valley floor steepens. The same process is repeated at the second reversal after which the train continues to Shahgai and onto Landi Kotal. Landi Kotal is much as you might expect - a border trading post that is one great bazaar. It is a place for hard men armed to the teeth. There are no women on the streets. There are places to eat, buy a fresh goat kebab, have your teeth fixed, get a cup of chai, buy vegetables, get stoned, order a Kalashnikov or purchase weapons off the shelf. It is like nothing you have ever seen. The return journey follows much the same pattern except there is one big surprise. The locos need not work on the downhill run and the crews relax as the locos coast. Down through Shahgai, the reversals and onto Jamrud. The pass is far behind now and you are tired, dusty and ready for a decent meal. You probably doze a little as the clickety-clack makes you drowsy. Suddenly a fusillade of stones and bricks hits the train. Some fly through the open windows ricocheting around the seats. Everybody ducks for cover. The kids are out of school and the train is their favourite target. We are back in Peshawar.